Info | WellFed Lawn Care | Caring for your lawn! To Hire or Not to Hire….So you Think you can do it Yourself? To Hire…Or not to Hire…..So you think you can do it yourself? So you’ve decided that this year your going to take care of the lawn yourself. Not a terrible idea, you are a pretty talented homeowner and remember when the porch needed painting last summer? Yeah you handled that with ease right? You weren’t exactly thrilled with the response you got when you asked your current lawn care service about the chemicals they tend to apply. It’s not uncommon to hear the answer, “hey look, I’ve been using that stuff for years and I’m fine, okay.” It sure makes sense that if you are going to take the plunge and try to use fewer chemicals than you should probably try it on your own. However, before taking the plunge completely you need to consider the following items. *** First let’s look at the time commitment. To treat weeds and fertilize your lawn may take 30-60 minutes per treatment — it all depends on the size of your yard. There is also a learning curve to understand what products to use, how much to use and when to use them. While this isn’t a huge commitment, it does involve some time. So the big question is what is your time worth? ***If you don’t have a fertilizer spreader, you’ll need one. Perhaps you can borrow one, but most people simply buy one. They can range from $30-60, depending on model. Fertilizer and weed control products generally are available in liquid and granular form. Granular products can cost $20 – $60 per bag depending on the size bag you purchase. How big is your lawn? Do you know how much product you will need? ***The biggest mistake made by homeowners when they fertilize their lawns is application of the product itself. They simply do a poor job of spreading the fertilizer on the lawn. 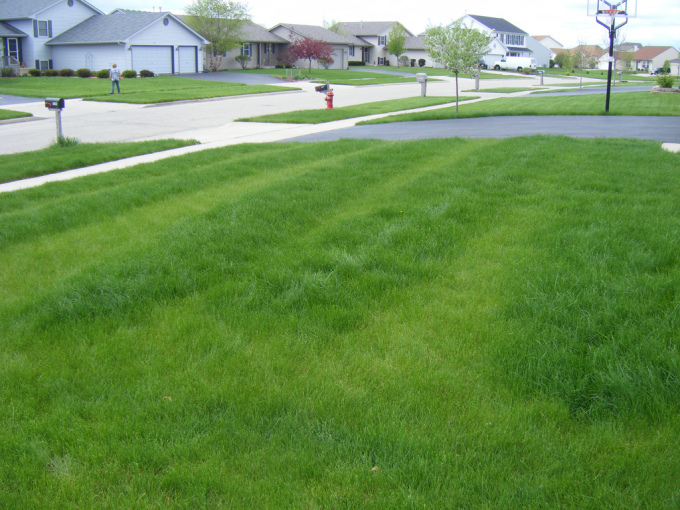 Have you seen those striped lawns around the neighborhood? Let us offer some advice based on our experience. Organic lawn care is difficult. It’s a completely different strategy than chemical lawn care and the products that your BeeSafe Applicator will use to treat your lawn are very different than most things you would buy at the store. Also, it’s not uncommon to see something going wrong and then decide that you better apply “more.” How about if you can’t diagnose the issue with your lawn and just start guessing at things. Many times when homeowners decide to do it themselves with the interest of using less they often times end up using more than even the chemical company would have in the first place. This entry was posted in Uncategorized on February 16, 2015 by jordan. This is Well Fed Lawn Care. We believe in a new way of doing things when it comes to the lawn care industry. If you’re tired of not knowing who is working on your lawn, tired of people smoking on your lawn, tired of people not showing up, tired of people not calling you back, then give us a call. We believe that lawn care is an actual business, not just a hobby. And it is our goal to address your lawn with absolute professionalism. We make it a habit of calling customers back, or wait.. how about we just answer the phone! Yea, that will work. We also wear uniforms, won’t smoke on your property, look and act professional, and change the direction we mow your lawn every week to avoid ruts. We also offer discounts and coupons!!! We also structure our pricing based on the oil market. We know exactly where we live and know how things work around here. We want to keep your business and help you out. So if we have to take a little bit of a hit in the wallet then so be it. Our goal isn’t just to make money, but to have you confident in your lawn. Thank you for coming on board with Well Fed and we look forward to serving you. This entry was posted in Uncategorized on January 27, 2015 by jordan.